So as a huge Marvel fan I had to go watch Thor Ragnarok in theaters. The theater actually reminded me of the theater at Mill No .5 and it was pretty small for a place called “Megabox”. The ticket was 9/10 USD and my caramel popcorn and lemonade was also around nine dollars. They sell squid ,octopus, garlic popcorn, caramel popcorn, regular popcorn, different types of “-ade” , fried chicken and a few other things at the concession stand. It was interesting to have the smell of fish in the air at a movie theater. The movie had Korean subtitles of course and it’s original English dub. Due to technical issues and sickness, I couldn’t upload on Sunday/Monday like I normally do. I was trying to make the video for this event but the program I use decided otherwise. So instead I’ll give a brief summary of our experience. We booked our tickets through a website called “Trazy”. It was 39USD for the ticket and transportation combined. I truly don’t recommend ever doing this unless you don’t mind not eating a real meal for a good twenty-four hours. The agency picked us up at hongdae station and we were on the bus for almost six instead of three hours due to traffic and poor timing for leaving. They dropped us off at an empty ski lodge, literally empty. The only restaurant open was a cafe and a lying worker who stated there was no bagels…there was a giant bag right behind him. So everyone on the trip ate convenience store food and just our luck we got the worse convenience store in all of Korea and I ate this fake chicken with spicy sauce nonsense. It is not the frozen “TGI Fridays” chicken we have back at the POD. It was shaped like chicken wings, but the texture and consistency was of old meatballs that your grandmother made a month ago. I will spare you anymore details. Then after leaving the place that looked like Jason was gonna pop out with an axe at any moment we went to the concert. 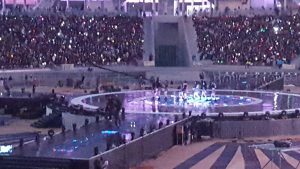 They are holding the Winter Olympics in the same dome in Pyeongchan that our concert was in so they really hammered that in. The concert was loads of fun but was a terrible set up for a concert as the stage was far away no matter how close you are in seating and then we were outside in, I kid you not, 28/29 ℉ for six hours. A friend told me today that some people had hypothermia and had to go to the hospital soon after. 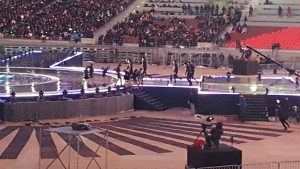 It was quite clear that they cared more about the promotion of the Olympics than they did the safety of the audience and the idols/hosts on stage. Every idol had to mention the Olympics and it was promoted on the screen at every intermission. We were instructed to bring hot packs and a blanket so of course I brought what I refer to as my “Hey Arnold blankie” and a hot pack. They gave us more but the one that I bought was far better and was still hot the next day. I wore my Dr. Martens and my heat retention tights from Uniqlo under my jeans and even I started to worry about my safety. My feet burned from the cold by the sixth hour and they weren’t okay again until we started walking back to the bus. The friend next to me was quiet almost the whole time and only spoke to voice her pain. I have no idea how they are gonna hold the winter Olympics there and I don’t watch it so if I were to hear it was to be a complete disaster I would not be surprised. The dome isn’t set up to be able to have a roof to close over it so unless they are adding that or they won’t have people in there for long it is t exactly the most safe situation. I’m fine, I think, yesterday I had to miss all my classes and could barely get out of my bed without tipping over but today I felt a lot better. I have a feeling I am going to get very, very sick though. It was nice to finally see a member of Super Junior after ten years (albeit not my favorite one) and I saw Exo again (Exo-CBX, not all of them again) and many other groups that I wouldn’t have paid to see solo but was nice to still see in person. Many of you may have heard of the Japanese animation studio “Studio Ghibli”. It is most famously known for titles such as “My Neighbor Totoro” , “Spirited Away”, “Kiki’s Delivery Service” and “Ponyo”. They have many other famous titles and also less known , but with a cult following, titles. They’ve opened up several stores in Seoul recently. Last year I went the one in Yongsan-gu and this year I’ve gone to the one in Hongdae. Walking into one of these stores is like walking into a Studio Ghibli movie and it’s hard not to gush with a life size Catbus and a life size sleeping Totoro in the same room as you!